Yesterday evening while my soup was simmering (This super-fast and ridiculously simple and easy but tasty recipe for red lentil soup; went great with challah to dip in it. Shabbat Shalom! 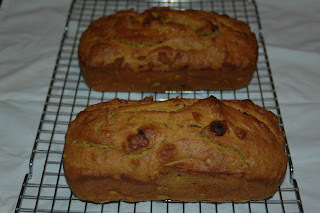 ), I quickly whipped up the batter for the Ginger Pumpkin Bread from MS Everyday Food. The recipe makes 2 small loaves. They're supposed to bake for 50 minutes, but I think I ended up doing 60 minutes to get the middles thoroughly baked. The bread came out moist and quite tasty, but really what made it were the chopped walnuts and dried cherries I added. I don't think I would have loved it all that much. I'd definitely make it again, probably next time with walnuts and chopped candied ginger. In other news, Mimi is insane. She was awake ALL DAY today. She usually isn't awake for more than 2 hours at a clip, but today she would not fall asleep. She wasn't cranky for the most part, just awake and alert. She was awake the better part of 8 hours, and it was making us cuckoo, try to feed her and soothe her to sleep, but she just was not having it. She turned 8 weeks yesterday, and like clockwork she's in a new phase. Gah. The early baby days are rather maddening. I am so sorry for you..I feel your pain...I think sleep is underrated...I hope she sleeps better today....if it is any consolation, at least she is cute :). Women can be super difficult if they are beautiful :).